Video increases conversion and engagement rates more than any other content – so why aren’t you doing more of it? Videos can be pre-recorded, live, or slide-show/movie style. No fancy equipment needed these days! Apps exist in abundance to help you in this arena. Not everyone watches video with sound on, so it’s important to vary content to include graphics and text for those watching on silent mode. Ultimately, you should test out multiple types of videos on your page to see what content resonates most with your customers. Videos should be 15 seconds to 2 minutes long, unless you’re doing live or streaming which can run 5-10 minutes to multiple hours in length. Stuck when it comes the kinds of videos you want to create? 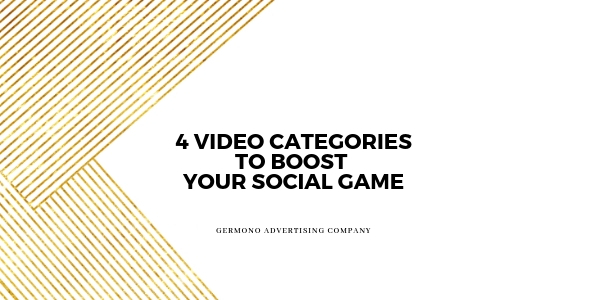 While you can certainly share others’ creations, here are 4 video content categories all about you to boost your social content. “People Love Us” – “Word of mouth” advertising is still one of the most powerful tools for converting a prospect into a customer. Since social came along, your word of mouth advertising can live on for a very, very long time in the form of testimonial videos. Strategies here can vary from produced testimonials (you guide clients on topics to cover, bring in for production purposes) to user-generated (they tagged you in a post on their page saying how awesome your product was). Pro Tip: Post requests for user-generated video content as part of your content strategy. Reward those who participate. “Listen To Us” – These are sometimes known as “talking head” videos and have become very popular in the Facebook Live feeds (I’m guilty!). While these types of videos aren’t everyone’s cup of tea in both delivery and reception, these continually see a high engagement and view rate. You (or a team member) can discuss business news, educational topics related to your business, or interview a guest from the comfort of a private setting. You can take a tour of your facilities, show a team challenge happening in real time. The big caveat here: there’s lots of talking, so the audience has to have sound on. Pro tip: A ring light, a tripod, and an external mic can be incredibly helpful if you plan on doing a lot of these. “Come Hang Out With Us” – This style of video is best used at an event or out and about in the community. On the street interviews asking questions to passer-bys in the bustling city, profiling those vendors and customers at your open house – this is a great way to showcase your visibility and partnerships in the community. Pro tip: Have a plan of attack here. Don’t pan to someone and ask them questions if they’re not prepared – especially if it’s another business. Deer in the headlights isn’t a good look on anyone! Bonus tip: always carry release waivers when you are shooting so you can get signatures on site! “Let Us Show You” – Product demonstrations. How stuff works. New product launches, improvements to existing products, tutorials – these all fall in the realm of the “Let Us Show You” category. Pro tip: Show, don’t tell (like our client Julie G. Benson Handmade did). Less description in these videos, more action. Don’t let bad lighting ruin a great product. Still reading? Here’s your homework: using the four categories above, jot down video ideas underneath each that apply to your business specifically. Feel free to share them in the comments and plug your business while you’re at it!